Sgt. Chris Wicklund of the Burnsville, Minn., Police Department wears a body camera. On a February morning, Taser International CEO Rick Smith paced in front of a crowd of hundreds of law enforcement officers from across California. Known for its electronic weapons, the ubiquitous stun guns used by law enforcement around the world, Taser is banking its future on recording and documenting what police do in the field. Gesturing to a presentation on a projection screen behind him, Smith extolled the virtues of his company’s hottest new offering: a body-worn camera system complete with a private cloud-storage service, Evidence.com. The national conversation over police brutality and accountability has raged since a grand jury decided not to indict Officer Darren Wilson in November in the killing of Michael Brown in Ferguson, Missouri, and it has been stoked by last month’s in-custody death of Freddie Gray in Baltimore and the ensuing protests in other cities. In December, President Barack Obama announced a program to provide $75 million in federal funds over three years to purchase body cameras for law enforcement officers nationwide. Taser’s aggressive move into the body camera business amid this debate, and those of other companies, represents a sea change in the law enforcement industry and raises questions about whether police agencies should be handing over evidence to a private company. There also are questions about Taser’s tactics to secure contracts for its new products. An Associated Press report earlier this year highlighted the company’s practice of hiring former police chiefs to pitch Taser’s body cameras to departments. One city, San Francisco, currently is testing Taser’s Axon model for a pilot project, and the mayor has proposed spending more than $3 million to equip police officers with body cameras. The city hasn’t crafted a policy regarding evidence storage. Public Defender Jeff Adachi, whose agency has made headlines by using video to expose criminal conduct by San Francisco officers over the past few years, worries that Taser’s law enforcement ties and privatized evidence storage platform will have negative consequences for the city’s court system. In San Francisco, a recent scandal involving racist text messages sent among 14 police officers, including one captain, didn’t come to light until years later because internal affairs investigators didn’t forward the case to the police chief. Police department spokesman Officer Carlos Manfredi said body cameras will make “for better police-citizen interaction” but would not respond to questions regarding sharing evidence or whether the department has consulted with the San Francisco district attorney or public defender about the new technology. Taser’s Axon body camera system rapidly is becoming the market leader. Police in Albuquerque, New Mexico; Los Angeles; New Orleans; Miami; Pittsburgh; Fort Worth, Texas; London and elsewhere currently are testing the system or have decided to buy it. Evidence.com would provide a one-stop shop for digitized evidence and get municipalities around the cost and hassle of maintaining and securing their own servers. “Utilizing our cloud-based solution allows agencies to rapidly adopt new technology without the cost and complexity of managing the hardware or software in-house,” Taser said in its 2014 annual report. According to Smith’s remarks at the February meeting at California Highway Patrol headquarters in Sacramento, more than 5,000 law enforcement agencies use the company’s Evidence.com service. The new technology has boosted the company’s stock price since the beginning of the year and represents less risk than Taser’s controversial stun guns, which have been a magnet for wrongful death lawsuits. Sales of the combined system totaled $57 million last year, compared with $14 million in 2013. At sales events in Canada and California last winter and in an interview with Reveal, Taser CEO Smith said Evidence.com benefited from the sophisticated security services provided by Amazon Web Services. Taser’s cloud-based evidence strategy is central to the company’s plan for profitability. The company is focusing on increasing annual Evidence.com subscriptions, which range from $15 to $109 per month, or up to $1,200 per year per camera – that’s up to three times the $399 price tag of the hardware itself. For large departments, this carries a hefty price tag: The Los Angeles Police Department’s purchase of cameras for its patrol officers is expected to cost $7 million a year. In San Francisco, adoption by police has been dogged by concerns over the spiraling costs. Body camera footage – along with audio, pictures, documents, location data from GPS devices and license-plate readers, and other information gathered by law enforcement – would be uploaded to servers maintained by Amazon Web Services. The company already claims to house a petabyte of digital evidence for thousands of police departments across the country. Taser also has faced scrutiny for its sales relationships with law enforcement officials. Two former police chiefs, Raymond Schultz of Albuquerque and Ronal Serpas of New Orleans, spoke at Taser’s Ottawa, Canada, sales event in December. Schultz’s dealings with Taser later were investigated by the New Mexico state auditor, who pointed to flights, meals, and other benefits Taser lavished on Schultz before he helped the company win a no-bid contract to provide cameras and cloud storage. Schultz also worked as a consultant for Taser before he left the helm of the Albuquerque Police Department, possibly violating conflict-of-interest and public procurement policies. “The final decision to implement the Taser cameras was made by the successor of Chief Schultz,” he told Reveal in an emailed statement. Taser spokeswoman Sydney Siegmeth told Reveal that Schultz’s travel and consultancy with Taser were above board. “Those are pretty standard practice for having someone come speak at an event, either at a trade show or one of our own events,” she said. The same day that New Mexico’s auditor filed his report, Taser told Reveal that it had implemented a new policy for former law enforcement personnel. Taser now will wait at least a year before hiring anyone who leaves the force, but will honor agreements already in place. Elsewhere, donations from Taser to the Los Angeles Police Foundation, and its subsequent purchase and donation of body cameras and cloud services to the Los Angeles Police Department, have raised concern from city officials that the company skirted proper procurement to secure a no-bid, sole-source contract. Police Commission President Steve Soboroff told the Los Angeles Daily News that no donors or foundation officials had any influence on the choice. The use of private services to store digital evidence will not change law enforcement agencies’ legal obligation to retain evidence that either could be exculpatory for defendants or impeach the testimony of law enforcement officers, a precedent set in the 1963 landmark case Brady v. Maryland. The private sector is obliged to follow the same standard of evidence preservation and access as the law enforcement industry. But legal scholars and public defenders have expressed concerns that Taser and law enforcement agencies now must share the burden of safeguarding and sharing evidence with defense attorneys in a secure, impartial manner. Currently, there are no national standards for the use of police body cameras and the storage of video obtained by such devices. State legislatures around the country, including California’s, are considering bills that would establish standards for how departments use such devices. “The more data you get, the more police departments face the same problems as private corporations – they don’t have the in-house capacity. But the duties of evidence preservation are nondelegable,” Imwinkelried said. The San Diego Police Department has the largest deployment of Taser’s body cameras, with 600 units distributed to officers since June. 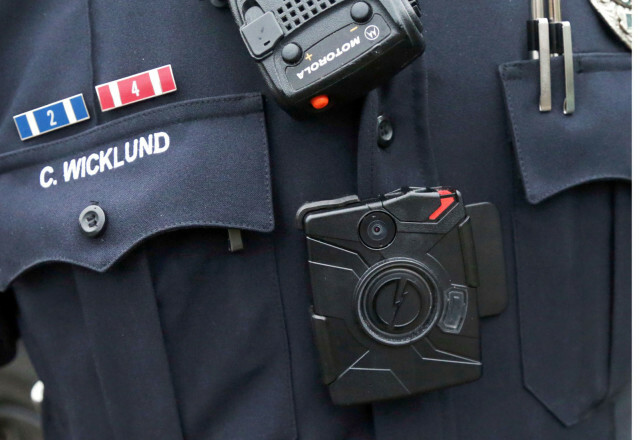 The department purchased body-worn cameras to address racial profiling concerns from the city’s communities of color, as well as in response to several officers’ highly publicized cases of sexual abuse allegations while on duty. According to Taser’s $3.9 million contract with San Diego, the police department will receive 400 more cameras by 2016. The department also bought a five-year subscription to Evidence.com with a ceiling of 35 terabytes for storage. As of late April, the department had 15 terabytes of footage and information stored on Evidence.com. In a crowded office on the fourth floor of San Diego police headquarters, the Operational Support Division oversees the downloading, uploading, dissemination and maintenance of the rapidly growing repository of digital patrol officer camera footage. “It was easier to go into the cloud for cost, but it was also easier for the actual retention and security of the videos. They have a lot of safeguards in place,” said Officer Ed LaValle, who leads the department’s body camera and cloud storage program. Other departments he contacted that use internal storage for camera footage and digital evidence had up to a dozen officers assigned to handle and process that evidence. By contrast, the San Diego Police Department has four people working on cameras and digital evidence storage. Not everyone in San Diego is comfortable turning over evidence to a third-party company. Brian Marvel, president of the San Diego Police Officers Association, said that while cloud storage saves money, he has questions about access and security of the data. “Originally when we had the cameras, we were hard-lined – the information went through our own lines; you couldn’t hack into it because it was all internal,” Marvel said. However, now both the city attorney and the district attorney’s office have access to the San Diego Police Department’s evidence system for prosecutions. He also raised the question about what procedures exist for dealing with potential leaks of body camera footage.